While those of a rocky disposition will probably walk on, anyone remotely jazz-inclined would be forgiven for thinking that it's their birthday too. Incredibly deep, interesting sounds. Hand-shaped bells. Great vintage looks. Only limited amounts are being made! Istanbul Agop is a company so steeped in the history of cymbal-making that it's something of a surprise that it is only 30 years old - it's as though the company has been around for longer. But no, three decades it is, and to commemorate the occasion it has produced a set of anniversary cymbals: two rides and a pair of hi-hats. Begun in 1980, Istanbul Agop initially traded under the name of Zilciler. Company founder Agop Tomurcuk had been the foreman at Zildjian's old K factory in Istanbul up until its closure in 1978. "Such cymbals demand to be played into, and all variations in dynamics and speed that we threw at them were taken in their stride." Agop's renown as a cymbalsmith meant that Zilciler cymbals - rebranded Istanbul early in the company's life - soon came to the attention of cymbal lovers. When Agop died in 1996, his two sons, Arman and Sarkis, took over the running of the company. Though Istanbul Agop's cymbal designs have evolved in all directions it's perhaps fitting that these 30th Anniversary cymbals return to its roots by echoing the designs of vintage Ks. Scheduled to be in production for this year only, the cymbals' numbers are further limited by the vast numbers of man hours that go into each model. Top of a host of outstanding features are the cymbals' hand-shaped bells. Contemporary cymbal makers - including Istanbul Agop - routinely save time and labour costs by stamping the bell in a single mechanised movement. Hand-shaping the bell is a high art reserved for only the most experienced cymbalsmiths, and at Istanbul Agop a single hammersmith is responsible for every anniversary cymbal's bell. The resulting cymbals can truly claim to be hand-made, with each finished instrument being unique. Arman and Sarkis Tomurcuk were heavily involved with the design and prototype stages of the cymbals and every model is inspected, played and then signed under the bell by both brothers before being released. The two rides - 20" and 22" - are thin and weigh in at 2,100 grams and 2,400 grams, while the 14" hats are paper-thin and a mere 1,150 grams combined. Their profiles curve gently down from smallish but rugged-looking bells, while a mass of hammer marks and lathing bands fill their surfaces. In a nod to vintage aesthetics, the cymbals are free of any transfer logos, being identified instead by three vertically-arranged stamps. Being so light and thin, the hi-hats are endowed with an intoxicating degree of warmth and responsiveness. Closed, they give a deep, tangy note which is sheathed in gentle brightness. Opened up, the note broadens then dissolves into a smooth, fuzzy wash that had me hunting for hidden rivets. And stepping them kept us occupied for hours - literally. It's as though the sound they make is as soft and pliable as the hats themselves. The rides, while also not being especially loud, are far from subdued - being suffused with a spiky, almost seething tonality. The stick response is a woody/silvery 'tah' that seems a step away from getting angry, as if each 'tah' is being spat out. Moving onto the bell compresses and intensifies these qualities, sharpening the sound further. Then there's the wash: the only remotely accurate description is 'roar'. Again, this doesn't allude to the volume generated; more its timbre and insistent presence. Accompanying the gentlest touch, the wash is a hissing, churning, oceanic backdrop rolling along restlessly beneath the pulse. It never builds so far as to divert attention from the pattern, but it's a big factor in the overall sound. Crashing results in a dark, trashy eruption that subsides to a washy undertow. Such cymbals demand to be played into, and all the variations in dynamics and speed that we threw at them were taken in their stride. We then found ourselves doing the opposite and hitting them once to listen, utterly absorbed, to the decay. Swapping sticks for mallets proved to be as engrossing. The overlapping waves of swell that the mallets encouraged revealed yet more tonal depths. Even though we played the rides every day for the period that we had custody of them, we got the impression that we hadn't heard all they had to offer. 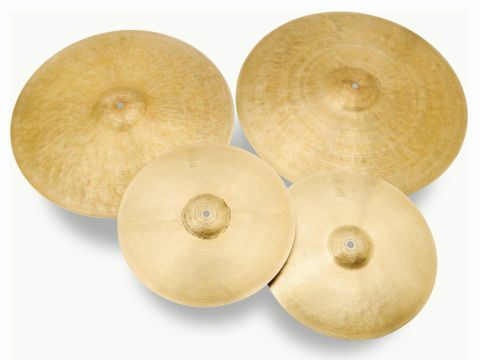 Istanbul Agop has produced a set of cymbals that are uncannily similar to the vintage Turkish Ks that inspired them. Like their aged counterparts, they are instruments full of character and subtlety. The hi-hats are exquisite - physically slight but beautifully voiced and hugely playable. The rides are equally stunning, with the 22" being the standout model of this selection. It's an astonishingly complex and involving cymbal, the sort that you could happily spend a lifetime discovering all of its nuances.